Last night, by the time I came home from my neighbor's house, my kids were in bed. David mentioned that Sawyer was sleeping with Sage. Because they were scared. After I heard all the giggling, I decided I'd better go investigate. Mainly because it was after 9 and I was starting to consider whether I was going to go to bed, and it's seems, well, unseemly to go to sleep before your kids. There they were, snuggled up in Sage's bed. Each had a mag light. And their Kung Zhus. Because who doesn't need some kind of crazy ninja hamster to protect them? AnyIwishmyhusbandwouldstopbuyingthiscrap, I asked what was going on. They said they're scared, because a neighbor kid? He told them that there was this Mean Girl who roamed the street in the middle of the night and attacked kids. Now, this child did get some hair literally ripped out of his head last summer by Mean Girl. But not in the middle of the night. MG lives on a street right near ours and occasionally wanders up, so something must've happened. She and her sister and a friend - they're all tweens - were sitting on the curb of the house diagonally across from mine. Meanwhile, MY kids - and eight other neighbor kids - were on their bikes and razors and were yelling "KILL THEM" at the girls. From a safe distance of a 100 yards or so. When we figured out what was going on we made the kids stop shouting. Which is when the older brother of the child who got his hair yanked out told me about the incident. I didn't think much about it after that. I went over to my neighbor's house to see the new flooring and to chat. David took Sawyer and Sage home (X was sleeping, this was about 8:30 p.m.). And there I was, about 45 minutes later, trying to assure my kids that no Boogeygirl was going to rip out their hair in their sleep, and that I was sure HER mommy wouldn't let her wander the neighborhood late at night. Logic has no impact on the imagination of a child. How many times, when I was little, did I lie awake at night, terrified by the shadows on the wall, SURE it was someone outside my second-story window? Or a creak or bang or rustle left me wide-eyed, peering out from under my blanket? Hell, I STILL do that, when David's out of town. Even though I know it's silly. Even though I have two large dogs and bolt locks and an alarm system. I still get a little freaked out by things that go bump in the night. Sawyer eventually returned to his own room. But Sage? After a visit at 10:30 to get a drink of water and pee, she went back to her room - only to return 30 minutes later. She crawled into our bed and fell asleep, and David was able to return her to her bed. She woke up this morning. And guess what she said. "Mommy? He was just trying to scare us." Things always seem much clearer in the morning's light. She is adorable. Although I'm sure it it were my kid, I would've had to resist the urge to slam my head on the wall and go "THAT'S WHAT I WAS SAYING." You should start a review blog of all the stuff your hubs buys and call it, "Crazy Ninja Hampsters." I love the fact that in the morning your daughter said those words - and what a beautiful picture of her. Cute story. Glad she finally figured it out. yeah there's a group of older guys in our neighborhood that Lars insists on calling The Bully Boys. Don't know that they've done anything untoward, but Lars is convinced. I haven't been able to make him see that sometimes people live up to their labels. ah well. maybe he knows something I don't. Lisa - You know, you might be on to something. Maybe a vlog, so I can do an entire presentation. Then again, they pretty much lose everything they get, so it'd be way short. Kirsten - Maybe Lars is onto something..
We had a neighborhood kid that terrorized everyone when I was younger. I should have been afraid of him breaking into my house though. He was nuts. 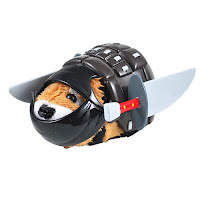 That crazy ninja hamster looks tough! Who needs an alarm system when you have one of those bad boys! That would be scary to think that there is a mean girl ouside ready to pull those underneath hairs on the back of my neck. Ouch...that would scare me too. Wait...that is who my daughter thinks I am. I bet the next day was a huge sigh of relief...for both of you! Oh dear GOD, do NOT tell me kids they can Ninja up their Zhu Zhu hamsters!! Stupid little toy & all it's damn accessories!! ANYWHO, all I could think of was sneaking in with my big sister when we were little...not for me, but because SHE used to have nightmares...& we'd giggle & whisper all night long!! Some of my favourite "sibling" memories! Great post!! I think it's so adorable how they comforted each other - that would be a pretty terrifying story for kids to hear. I'm a big fat chicken too when hubs is away - all I can think about are freaky scenes from horror movies. I guess even adults let our imaginations get the best of us! You have crazy ninja hamsters? How do we not have those? Those are awesome! Mean girls roaming the neighborhood at night to rip out children's hair . . . I am pretty sure I would have giggled. Although Kallan did go through a phase when she was afraid a huge bunny with fangs was going to sneak into her room and eat her. But that was because I let her watch a Wallace and Grommit movie in which there was a werewolf rabbit of gargantuan size. That was not one of my smarter moves. Very true. I still spook myself that someone is under my bed. Why DO men buy that crap? Salt - Just wait to you have kids. The crap you (or your husband) will buy just to shut them up! Mombshell - Oh, he's tough all right..you have NO idea..
Stef - Ooh..the underneath hairs..just sent a chill down my spine..
Mayor - Oh yes. The Kung Zhus. Very sweet memory about your sister! Pamela - Yes, and I have a VERY active imagination. Kris - LOVE me some Wallace and Grommit! I'm surprised your kids haven't seen the Kung Zhus yet..just wait..
Kate - morning cures a lot of stuff! Jill - Men buy it cause it's easier than dealing with the fallout of saying NO in ToysRUs!